Scoil Náisiúnta Uachtar Árd currently operates out of two school buildings, Ionad an Chlochair and Ionad Naomh Chuimín, which have always been known locally as “The Convent” and “The Boys’ School” respectively. Prior to amalgamation in 2008, all children entered junior infants in “The Convent” together, and classes were co-educational in Ionad an Chlochair until 2nd class, at which stage the boys ‘went off to the Boys’ School’. Since 2008, when the two schools were amalgamated under one Principal, Micheál O’Domhnaill, the whole school has been co-educational, with the four junior classes in “The Convent”, and the four senior classes in “The Boys’ School”. Plans are well under way for the construction of a brand new school to house all the children together, on the site of “The Boys’ School”. This year, the search for the new school’s name was carried out in consultation with parents, pupils and teachers, and Cuimín agus Caitríona was the final result. Cuimín and Caitríona are both people with a long and significant educational influence in the Oughterard area. Catherine McAuley (1778-1841), was the founder of the Sisters of Mercy, who in turn founded Scoil an Chlochair in Oughterard in 1888. Education was central to her life’s work, which was dedicated to improving the lives of the poor. Caitríona thus commemorates and honours Catherine’s legacy, and indebtedness of the school to the order for its very origins, and the ethos by which it was created and sustained. Saint Cuimín (592-662) is renowned as the most famous and learned Abbot of Clonfert. His scholarly reputation attracted students in great numbers to his monastery, attaining 3,000 monks at its height. He appears to have travelled west into Connemara, which may explain Oughterard’s long and affectionate devotion to the saint. 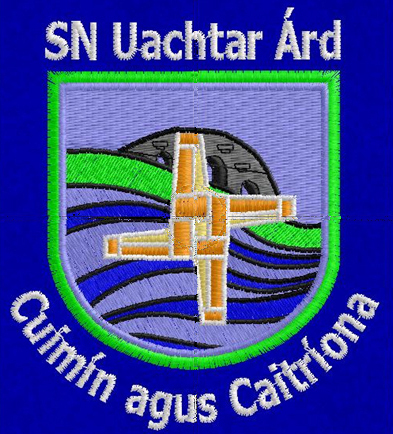 · The white and green trim and band in the crest signify the colours worn by the children as they represent our school, club and parish on the sports field. · The green band across the centre signifies the beautiful land and scenery in the area in which we all live. · The Bridget’s Cross is a traditional Gaelic Cross made by the children in the school every year. It signifies a strong tradition and faith. · The rippling water signifies the Owenriff and Lough Corrib, two huge influences in our locality, with our proud fishing and mayfly tradition. · The Owenriff Bridge is a landmark in Oughterard. On our crest it signifies the importance of building bridges; learning to grow together, and live with each other in respect. We also should cross our bridges and face the future with courage. With pride in their past and faith in the future, our children can face any trial that comes their way in hope. It is hoped that pupils for generations will have knowledge and respect for their school’s origins and history, and will represent their school and wear their crest with justifiable pride.